If you’re like you me, you occasionally often take photos that are not exactly level. Maybe the floor is at an angle, or a table looks like everything should be sliding off, or a sunset boasts a horizon that’s diagonal instead of, well, horizontal. 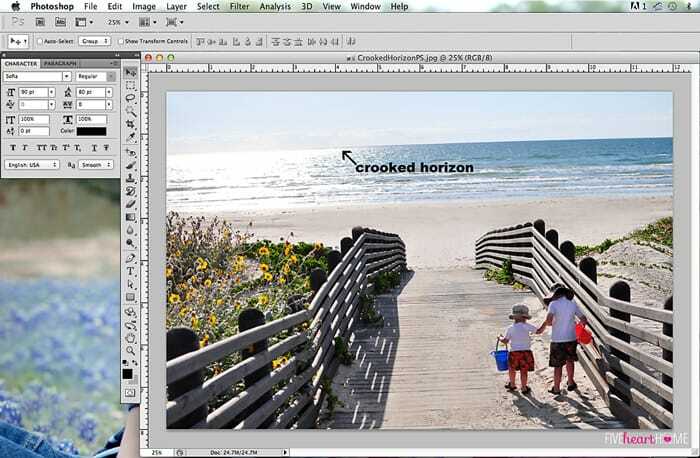 If this is ever a problem for you, have no fear…a quick and easy fix via Photoshop is just a few steps away! I used Photoshop CS5 for this tutorial, but I imagine that this technique would be similar in other versions of Photoshop. Open the photo that needs straightening. This is probably one of my favorite pictures that I’ve ever taken of my boys, but as you can see, the ocean looks like it’s going to pour off the left side of the photo. Mama was apparently so excited about this shot that she forgot to make sure her camera was level before pressing the shutter! Go to your Tools window, hover over the Eyedropper Tool, and press Control as you click. This will give you the option of changing the Eyedropper Tool to another tool. 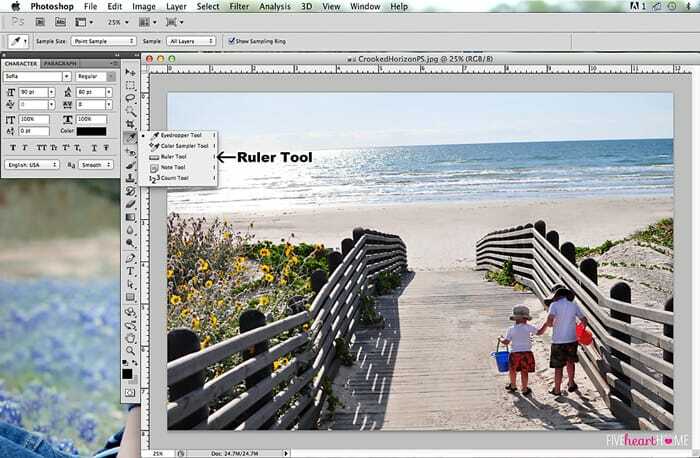 Highlight the Ruler Tool to choose it. 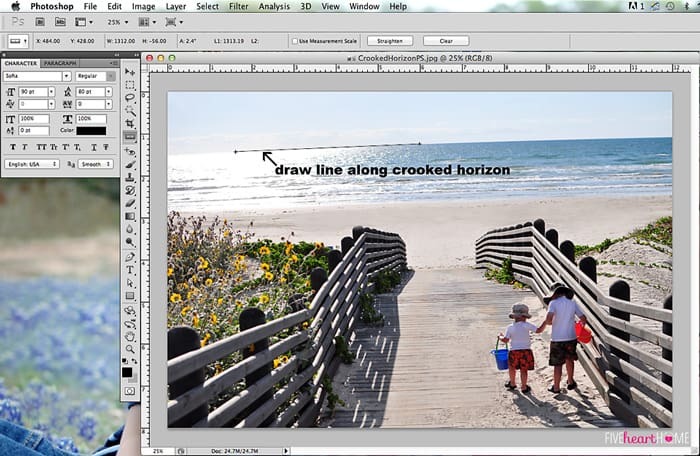 Using the Ruler Tool, draw a line along the edge of the horizon, or any other place that should be perfectly horizontal but is instead at an angle. This may be a tabletop, or where a floor meets a wall, or the top of a door frame…you get the idea. The line you draw may be short or long. It doesn’t really matter. Go to your Menu bar at the top and click on > Image > Image Rotation > Arbitrary. A Rotate Canvas box will pop up. The angle at which your photo needs to be rotated will already be filled in, and the CW (clockwise) or CCW (counter-clockwise) choice will already be selected. These were determined by the angle at which you drew your line with the Ruler Tool. All you need to do is click OK! Your image will now be rotated. The edges will be crooked but the horizon should be perfectly straight! It’s time to crop this sucker so that the sides of your photo are once again vertical and the top/bottom edges are horizontal. Choose your Crop Tool. Make sure that you have your desired dimensions typed into the Width and Height fields. In the screenshot above, you can see that I want my final photo to measure 12 inches wide and 8 inches high. 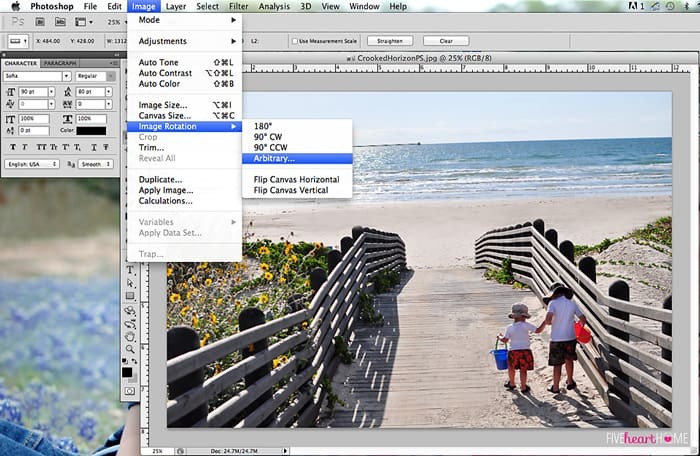 Crop your photo as desired. 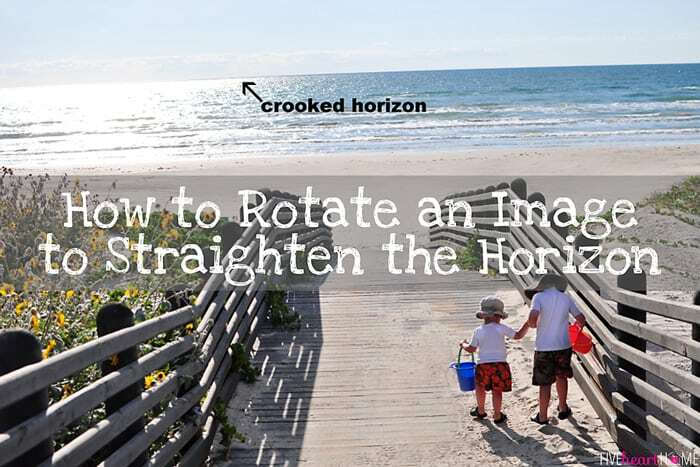 Straightening your photo is going to cause you to lose a little bit of your image around the edges, and the greater the degree to which its angle had to be corrected, the more you are going to lose. Hit Enter/Return and TA-DAAA!!! Your freshly cropped image should be nice and straight! It really is as simple as that. And please don’t let this tutorial intimidate you. It took me far longer to explain it than it takes to actually implement it! 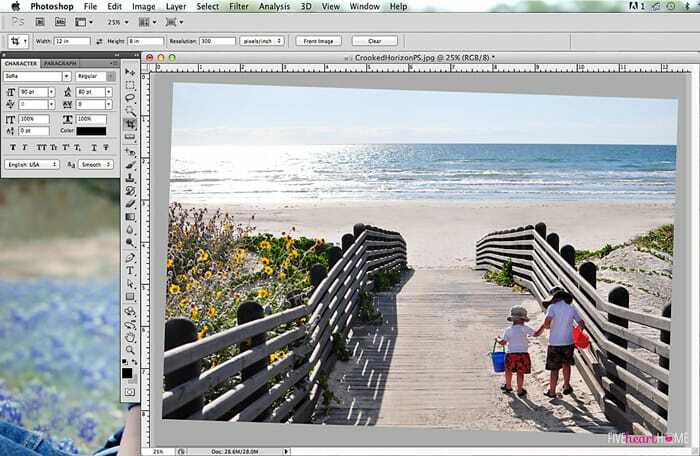 Once you get these steps down, you can straighten an image in under 30 seconds. Yay for no more photos that make you feel seasick looking at them! Questions? Comments? I’d love to hear from you if you find these Photoshop tutorials helpful! This post is linked to Sunday Linky #15 at Suburbs Mama. This is brilliant! Thanks so much for the tutorial! 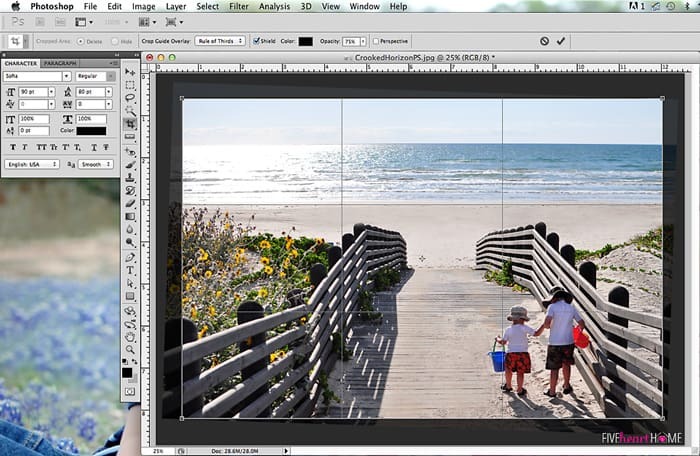 I use the baby version–Photoshop Elements–because it’s less intimidating, but maybe someday I’ll work my way up to full on Photoshop. What an adorable photo of your boys, by the way. I love watching brothers love on each other! Have a wonderful weekend, Samantha! Thanks so much, Abby! I hope your weekend is fabulous as well! This is super helpful! I’ve always wondered how to do this. Thanks!! Happy to help, Candace…I hope it’s useful to you! 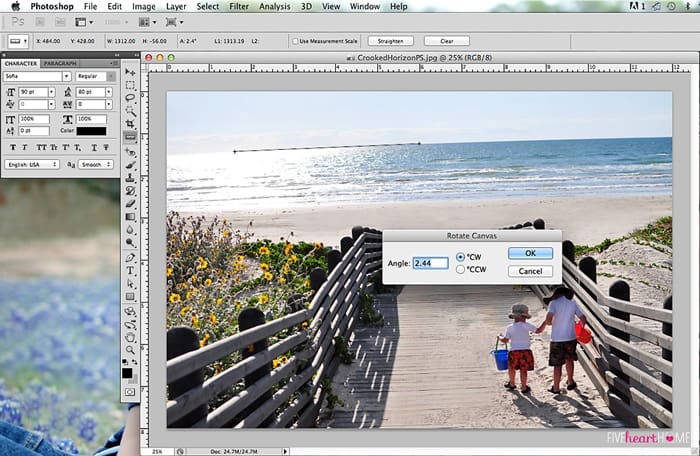 Do I have to download the “Photoshop”. I have never photoshopped photos on my computer. I need to fix some of my wedding pictures that are crooked due to the ground not leveled.